With the arrival of the 2015 Dodge Challenger, Dodge has made the ultimate statement vehicle: a sports car that out-handles and out-performs the competition and does so at a fraction of the cost. The 2015 Challenger is now available at Greenville's own Greenville Chrysler Dodge Jeep Ram, and we're proud to serve Farmersville, Commerce, TX and beyond with the best Dodge cars, trucks, SUVs, and vans—and even performance cars. The new Dodge Challenger is a take-no-prisoners rocket that doubles as an envy-inducing daily driver. It has been significantly updated and overhauled, and features four different engine options depending on just how much you want to peel away from stop lights. Updates this year include a brand new interior space and hot boosts to the exterior look including a new approach to the headlights, and grille, and everything else from head to tail. The new Dodge Challenger SRT Hellcat now also boasts a 707 horsepower V8 engine, making it the most powerful Dodge (and pretty much car) on the American market. Leg and headroom remain outstanding, especially considering the Challenger's low-riding frame, and remains the only muscle car to seat three passengers comfortably in the back. A new, impossibly large infotainment touchscreen joins the list of new interior features, and discerning drivers will love the new retro gauges and TFT screen. 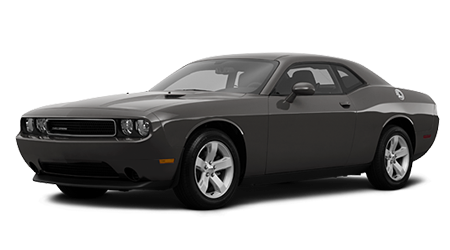 Other standards for the all-new 2015 Dodge Challenger include push-button start and keyless entry, Dodge's Uconnect system, a USB input plus auxiliary input for optimal use of your smart-devices, and a driver's-side knee airbag. Go big or go home with additional optional features like back-up warning sensors, a Heads-Up-Display unit, forward collision alerts, and blind-spot detection. In addition to the Hellcat engine, other power plants for the new Dodge Challenger at Greenville CDJR include a 3.6-liter V6, which nets 305 horsepower, a 5.7-liter Hemi, and a 6.4-liter V8, which steadily inches toward the Hellcat at 485 horsepower. Hellcat SRT's come with designated key-fobs which allow you to control just how much power you want to unleash, so be sure to ask the Greenville Chrysler Dodge Jeep Ram team about how this service works. Run, don't walk, into Greenville Chrysler Dodge Jeep Ram for one of the first test drives of the new Dodge Challenger. We're located in the heart of Greenville, TX, and look forward to seeing you soon.